What Is The Best Ride Cymbal? In first place, the best ride cymbal for the money is this beautiful Meinl Classics Custom Dark Ride. It offers professional quality, complex sounds at an unbeatable price. This ride cymbal is a versatile all-round performer with ultra-premium sounds that fits well with all musical genres. This ride cymbal has plenty of stick definition that cuts through with a full-bodied tone. It has a wide dynamic range and is a medium weight, allowing it to be played effectively as both a ride and as a crash cymbal. The bell on the cymbal provides a bright attack and a clear tonal definition. The bell is pronounced which means you can achieve a clean Ping each time you strike it. The premium B10 bronze alloy and unique finish provides this cymbal with a dry tone and beautiful dark sounds. This Meinl ride outperforms every other ride cymbal within its price range. It is so versatile and a joy to play! It fits right in with all popular musical genres with its unique dark sounds and cutting stick definition. This ride offers such premium sounds at an affordable price. It’s easily the best ride cymbal for the money, period. Next up on our list is this legendary Zildjian A Sweet Ride. It’s an incredible all-purpose ride cymbal that performs well in every area. It’s by far one of the most popular ride cymbal models in the world, and this cymbal bursts with a classic voice that is pure, bright and expressive. The Zildjian A series cymbals are forged with a B20 bronze alloy that give them their expensive, mellow and smooth sound. The machine hammering and lathing gives the cymbals a smooth, clean and shimmery character. This ride cymbal is highly articulate and has a defined stick response that makes it perfect for jazz, rock and blues music. It’s a medium weight cymbal that means it is also light enough to be crashed on and it has a fairly controlled amount of wash. I must say this cymbal has a great crash sound to it. This cymbal is an excellent workhorse because it delivers across every area, and it’s simply so versatile that it can suit such a diverse range of musical styles. For a premium budget, this is my winner of the best ride cymbal on the market. This Paiste PST7 Ride Cymbal is a truly fantastic ride cymbal for the money. It has a glossy yet mellow sound that far exceeds its price point. This cymbal has a precise, clear and defined sound that responds brilliantly to being played either on the bow, bell or when being crashed. Paiste cymbals are hand-lathed by Swiss craftsmen to achieve a traditional sound. The sound of this cymbal is reminiscent of a premium set of cymbals, much like the Zildjian A series or Sabian AAX range. But these cymbals offer unbeatable value for money. This ride cymbal has a well-defined sound on both the bell and bow when played with the drumstick tip. It has just the right amount of wash, with a bright and pronounced attack. It’s a medium weight ride cymbal with a great dynamic range to be played softly for jazz and hard for rock and metal. Overall this cymbal has a really clean sound and a bold character that will fit right in with most modern styles of music. This really is an incredible ride cymbal that will serve you well both in the studio and on stage. It is a strong contender for the best ride cymbal for the money. Here we have Meinl’s entry-level ride cymbal offering which is a practical and affordable ride cymbal. It’s a budget ride cymbal that is perfect for students finding their feet behind a drum set. Much like all Meinl Cymbals, this Meinl HCS Ride Cymbal is made in Germany and carries a full 2-Year guarantee. This ride cymbal is made of brass, and unlike other cheap brass cymbals, this ride cymbal is responsive and has a musical sound that works well with lots of different genres. It is rare to find a budget ride cymbal that has such a clean stick definition and musical tone, but this Meinl HCS ride has a complete sound that will enable a student to discover and learn more from playing the drums. This is the best ride cymbal on a budget because it delivers consistently across each area. It has a clean, pronounced bell that has a great ping to it, and a bright playing response on the bow of the cymbal. There is a good level of wash and bright musical overtones. It also has a good crash sound and a lot of volume that allows it to excel for rock and heavier styles of music too! 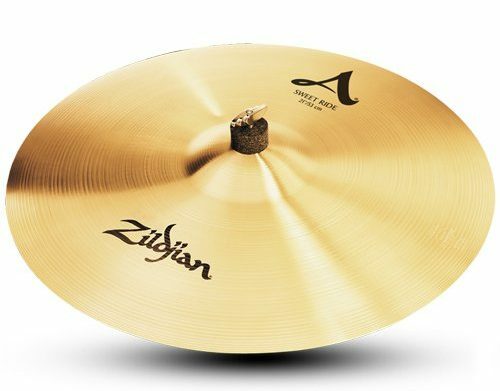 Lastly on our list we have this popular Zildjian ZBT Ride Cymbal, which has a great stick definition and a bright sound. It’s produced from B8 bronze which means it has a great response compared to other varieties of budget ride cymbals, and it features pioneering Zildjian hammering techniques for an optimal performance. This cymbal is a great choice for students and beginners, looking for achieving the Zildjian brand quality on a budget. It will allow you to explore a wide range of musical styles with its clean, defined sound. This cymbal is a medium-heavy weight and has a pronounced stick definition. It cuts through really well and the bell on this cymbal is a delight. It has a loud ping that works great for lots of musical styles including rock and funk. For the beginners looking to equip themselves with a good quality ride cymbal from a trusted brand this is one of the most popular choices to go for! The ride cymbal is staple part of any drum set. It’s the largest cymbal within the set, and as it’s name suggests its role is to provide a steady, riding pattern in a drumbeat. Unlike crash cymbals and other effects cymbals that are intended to enunciate the end of phrases and fills, the ride cymbal is designed to be played within a groove. A good ride cymbal will provide a distinct ping sound when played on the bow or bell to translate well within musical styles such as blues, jazz or funk. These types of popular ride patterns are eighth notes, triplets and swung rhythms. You will want a ride cymbal that ticks all of the boxes in terms of sound and versatility. A ride cymbal can be played in three main ways: on the bow with the tip, on the bell with the shoulder of the drumstick, and crashed on the edge. The bell of a ride cymbal will vary in size, but its important to note that the larger the bell is the heavier the ride cymbal will typically be, and therefore less ‘crashability’ it will have. The larger the bell means it can be struck more easily and it will also have an increasingly pronounced sound. Ride cymbals have the most ‘complex’ sound of all cymbals, and they offer a wide range of sounds. Some ride cymbals are dryer and more articulate, whilst others offer a more washy sound. The cymbal alloy, weight, lathing, hammering and bell size all together form the individual cymbal’s sound. 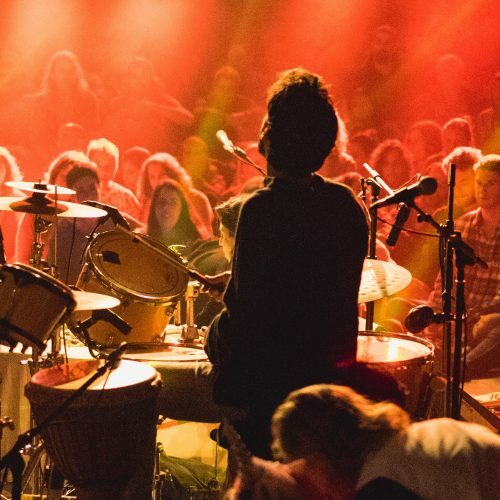 Unlike drums, that require drumheads and tuning, cymbals will retain their inherent sound qualities and they cannot be altered without damaging the cymbal through physical alterations. 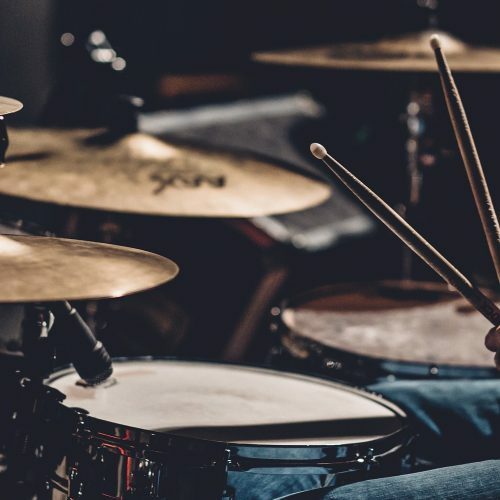 Because you can’t improve a cymbal’s sound through the same way you can with a drum, it’s important to invest in a good sounding ride cymbal that you believe will translate well sonically with your drum set. Poor quality cymbals will always sound terrible, and professional quality cymbals will always sound great. The main playing zone of a ride cymbal, and traditionally popular method of playing a ride cymbal is on the bow with the tip of a drumstick. This is what is used for intricate ride patterns within a whole range of musical genres including jazz, funk, blues, pop rock and metal! The cymbal will need to be the right balance of stick definition and washy overtones to have a musical sound. The next playing zone of a ride cymbal is the bell. The bell can vary in size and also in finish, with some ride cymbals featuring an un-lathed bell for a darker tone. The size of the bell will define its pitch and the level of volume produced. 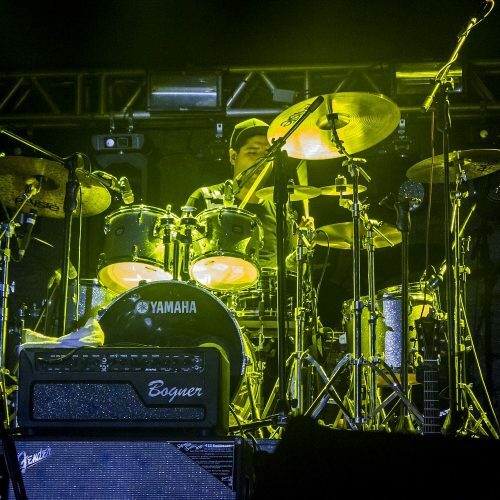 Ride cymbals used for heavier styles of music such as rock and metal will typically feature a larger bell, which produces greater volume and is also easier for the drummer to strike. The final playing zone of the ride cymbal is the edge, which is used for the ride cymbal to be played like a crash cymbal. The lighter the ride cymbal is, the greater crashability it will have. 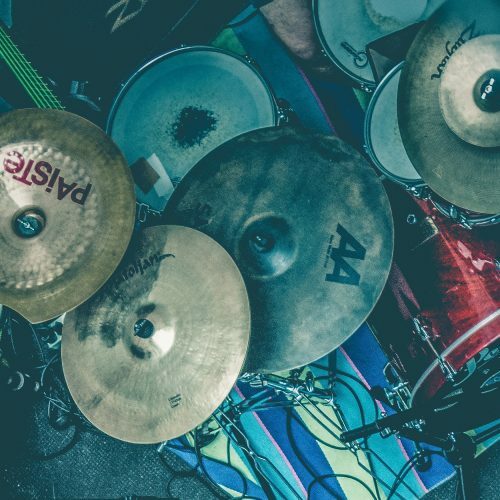 Modern ride cymbals need to be versatile enough to have the ability to be played as a crash to save touring drummers from needing two different cymbals to perform one job. Lots of rock drummers will use ride cymbals as a functioning crash cymbal for a large proportion of his playing. Traditionally, the best ride cymbal is one that is made from B20 bronze: a formula that is comprised of 80% copper and 20% tin, with traces of silver. But manufacturers like Meinl and Paiste have been experimenting with various types of bronze alloys with varying tin content to alter a cymbals sound. These two manufacturers have developed mid-priced point cymbals that are an enormous step up from typical affordable cymbals in terms of quality, tone, sound, versatility, playing response and stick definition. The B10 bronze Meinl Classics Custom Dark cymbals possess a dark, sonically rich sound that is much alike to those found in B20 bronze cymbals like the Zildjian K Custom range. And the Paiste PST7 cymbals are produced with a unique CuSn8 bronze alloy that stems from the professional 2002 series. B20 bronze cymbals still dominate the premium cymbal market, and are still the professional’s choice. But it’s important to use your ears over your eyes when it comes to choosing a ride cymbal. How Do I Choose A Ride Cymbal? Choosing the best ride cymbal for you might seem tricky. First of all, the most important piece of advice I can give is to use your ears! Sound is subjective, so decide what you like by listening. Can you visualize the cymbal sounding good with your drums? Will the cymbal complement the styles of music you play? Does the cymbal create a diverse sonic palette that you will feel inspired by? Is the cymbal dark or bright? Or washy or dry? This will have an impact on your overall musical voice behind the drum set! So it’s important to choose wisely.